“We are not creating a school," said Eduardo Carrera of Puerto Rico's Boys & Girls Clubs. “This is an attempt to break the generational cycle of poverty." SAN JUAN, Puerto Rico — For the past few days, Ana Cabrera, 42, has been bringing her 5-year-old son to the Boys & Girls Club of Puerto Rico building deep in the Ernesto Ramos Antonini affordable housing complex in the community of Villa Prades, where she lives. During this time, Cabrera and her son have been taking part in an orientation process to officially join Puerto Rico’s first charter school on Monday. Cabrera’s child is one of the 58 students joining Proyecto Vimenti, a kindergarten to first-grade school run by the Boys & Girls Clubs of Puerto Rico. Vimenti is the only charter school being put in place this semester as part of the island’s education reform law signed by Gov. Ricardo Rosselló in March. It was the first time Puerto Rico created a legal pathway to establish charter schools on the island. According to Eduardo Carrera, executive director of the Boys & Girls Clubs of Puerto Rico, the nonprofit had been developing Proyecto Vimenti for two years. But with the education reform law in place, the nonprofit saw an opportunity to bring the project to life. “We are not creating a school to address the education reform [law]. This [project] is an attempt to break the generational cycle of poverty,” said Carrera in Spanish during a recent press conference. Unlike the mainland U.S., the island's public education system mainly serves low-income communities; the majority of middle-income and upper-income families use parochial or private schools. On average, 70 to 80 percent of the student population at any given public school in the island live below the poverty line, according to numbers from the Puerto Rico Institute of Statistics (PRIS). Students under the poverty line are almost three times more likely to drop out of school than a student living in a household above the poverty line. 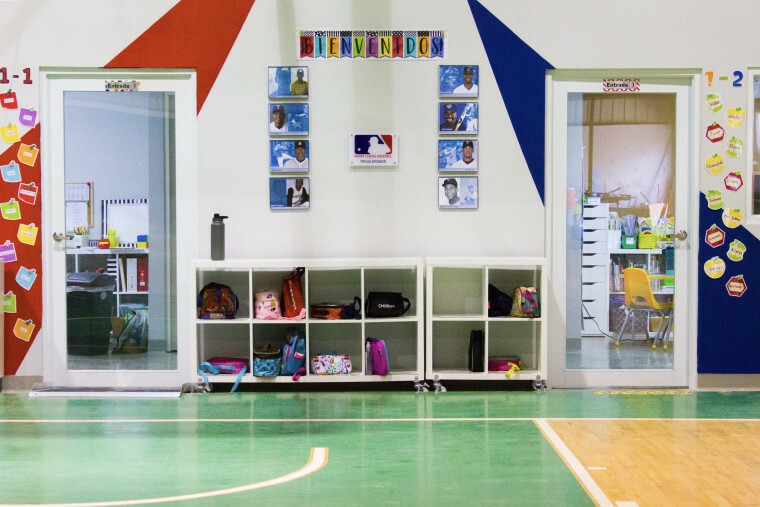 Vimenti is the first of three schools the Boys & Girls Clubs of Puerto Rico hopes to establish in the island. They modeled the school’s curriculum after that of St. John’s School, one of the island's most prestigious private schools. They also added their already-established after school program to Vimenti’s curriculum. “We have a great project to start with the charter school model, which will be in the hands of a highly reputable entity at an international level that has demonstrated a wide administrative capacity,” said Puerto Rico’s education secretary, Julia Keleher, in a press release. As part of the island's education reform process, officials closed over 250 public schools and implemented new online systems to manage teachers’ placements and student enrollments. All of these took place during the past months as families grappled with the ripple effects of devastating Hurricane Maria. Now, officials are moving forward with a plan to open several charter schools — a decision that has generated debate and discussion. Charter schools receive public and private funds in order to operate, and their financial and operational models have been the center of many heated debates for decades. People who favor the model see charters as public schools because enrollment is open to all students and there is no tuition. Critics argue that charter schools inject public funds into the private sector, raising concerns over public accountability and potential labor issues. For decades, one of the more vocal critics of charter schools in the island has been the Puerto Rico Teachers Association, known by their Spanish acronym AMPR. The group warns against diverting funds from public schools; the island's Department of Education is grappling with a $300 million shortfall. Though they did not succeed in their efforts this time around, AMPR was able to “introduce an amendment guaranteeing that the charter schools that hire teachers who are part of the [Department of Education] registry have to honor the acquired rights of the teachers, including salaries and everything they had previously,” Díaz said. However, all of the eight teachers Vimenti hired are not part of the Department of Education registry. Each classroom, two kindergartens and two first grades, has two teachers. Each teacher has a starting salary of $40,000, according to Carrera. That's higher than the average public school teacher salary of around $27,000. In January, the government announced an increase of $1,500 for public school teachers, the first in 10 years. Vimenti’s implementation is set to cost $16 million over four years. Carrera said the investment per child will be $18,000 for three years. In the fourth year, that would go down to $14,000. Of that amount, the government will contribute $6,400. The rest will be covered by the private sector or subsidies from public-private partnerships. In the future, they hope to serve 190 students up to fifth grade. So far, no government money has been disbursed to Vimenti, according to Carrera, but they have secured contributions from the Harold Alfond Foundation, which donated $1 million and two $500,000 donations from the nonprofit Fundación Colibrí and the singer Marc Anthony, respectively. Secretary Keleher, with the help of the Office and Federal Affairs committee, also selected other entities in the island to establish new charters schools from 2019 to 2020. Caras de las Américas, a nongovernmental organization under the umbrella of Puma Energy Foundation, requested a school in the town of Guaynabo. Although their charter school proposal was approved, they plan to launch their charter in the 2019-2020 school year. Others are still taking part in the selection and training process, according to the governor’s office. These include Techno Innovators, a robotics and technology education nonprofit, Centro para Puerto Rico, a nonprofit that promotes economic and community development, and a third entity, LEAP Social Enterprise. The municipalities taking part in the process to implement charter schools in their towns by 2020 are Naranjito, Villalba, Aibonito, Coamo, Cayey and Orocovis, according to the governor’s office.